Does the latest UEFI BIOS rejuvenate this Z170 Intel ATX mobo? The Designare does everything, is fast, robust and looks good too. It beat Z720 boards in our tests but it's still an expensive, last-generation board in the current market. The Z170X is our new test rig. As such it’s ground zero for our latest motherboard coverage and the benchmark against which everything else will be tested. Our motherboard reviews are for the general populace who understand a bit about motherboards but who aren’t fussed about intricate levels of advanced overclocking. There are other titles (and plenty of forums) dedicated to that. We’ll stick with what’s important in terms of features, value, and performance (which will include the onboard, automatic, performance-boosting, overclocking features that most people will stick with). Test rig: Gigabyte Z170X-Designare Socket 1151 motherboard, 4GHz Intel Skylake i7-6700K CPU, 2 x 8GB Corsair Vengeance LPX 2400MHz C16 DDR4 RAM, Samsung 960 Pro M.2 hard drive, Corsair H80i v2 Hydro Series, Corsair Platinum Series AX1200i 1200W Digital ATX Power Supply, Nvidia GeForce GTX 1070, Windows 10, Dell 2715PQ monitor. The first thing that hit us with the Designare was the Ultra Durable monicker and the nature of the reinforced connectors. To anyone that’s fumbled around with plugging and unplugging leads in the I/O ports, having a solid metal band surrounding them is a bonus. We also like the lack of heatpipes and clutter – we’ve suffered from overheating-related crashes with complex cooling technologies in the past. The remaining heatsinks aren’t oversized and shouldn’t get in the way of most coolers or cables. A full complement of connectors is present. A second M.2 port would probably be preferable to the U.2 port but back when this board first came out this looked like a reasonable solutions. The UEFI (modern BIOS) is simple enough to use. There are plenty of settings for hardened tweakers but the most important two for regular users – XMP (eXtreme memory profile) and automatic performance-boosting overclocking – are simple to find and adjust. The on-board hardware buttons for power, reset, CMOS clear and OC won’t be frequently used by anyone other than benchmarkers but they’re nice to have there. All in all it’s got it where it counts. We tested the Designare with three processors at default clock speeds and with maximum, automatic overclock settings – which it managed stably. For our Skylake (6th Generation) Core i7 6700K processor it pushed the default 4GHz clock to 4.6GHz. The latest F21 UEFI/BIOS provides support for Intel’s 7th Generation Kaby Lake processors (which essentially are tweaked 6th Gen processors) and allowed our i7 7700K Skylake chip to automatically overclock stably up to 5GHz from a stock 4.2GHz. It also pushed our 4.2GHz dual-core Core i3 7350K up to 4.6GHz. 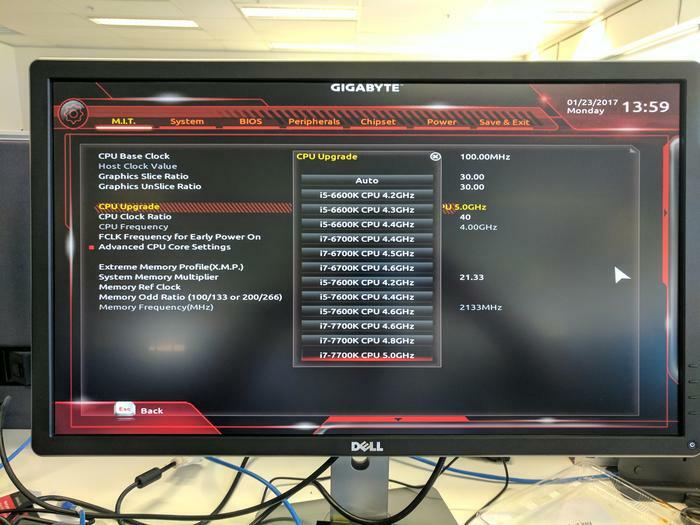 Gigabyte Z170X Designare motherboard results in PC Mark for Skylake and Kaby Lake Intel Chips at default clocks and overclocked. Gigabyte Z170X Designare motherboard results in 3D Mark at default clocks and overclocked. The Designare ocerclocked our 6700K chip to near 7700K performance in both PC Mark and 3D Mark. While the Kaby Lake i3 chip saw some impressive performance boosts, the i7 7700K, despite comfortably striding ahead of the field, didn’t achieve too much of an overclock boost despite the push to 5GHz. Perhaps a newer, Z270 chipset motherboard could make more of this? The deafault speeds and the automatic overclocked speeds of the same chips on the Asus Z270 Strix are actually slower than the older board in most cases. We tested the same chips on an Asus Strix Z270 motherboard and quickly saw the benefits of the Designare. All default speeds were lower on the newer board and we saw major freezes when using the basic, EZTune overclocking system on the Asus. In the end we settled on a default 9% overclock on it and PC Mark actually ran slower than the default speed. The overclocked score in Time Spy matched the Designare. Things may improve as the drivers and UEFI/BIOS mature but for now, that’s pretty poor performance. So the Designare is quick and stable even by current standards. Naturally we’re reviewing this late and so there are many caveats associated with a purchase decision, but we’ll press ahead in a spirit of giving it a fair review. Having also had the ability to test the latest “F21” UEFI/BIOS with Kaby Lake in addition to a Z270 board has given us an advantage over previous reviews – but has it affected the board’s value positively or negatively? At $349 is not cheap but it’s got everything and runs stably even with a hefty default overclock from 4GHz to 4.6GHz on our Core i7 6700K Skylake processor. However, with the price of a Kaby Lake 7700K being the same as the 6700K ($490) it’s probably only worth considering if you already have the older processor now – even though the architectural difference between Skylake and Kaby Lake is relatively minor – there’s still a noticeable performance boost. Having said that, performance on this board was all-round noticeably better than the newer Asus Z200 Strix. We’ll have to find a better Z200 board to recommend right now. Tweakers will get a lot more out of the Designare and while it will be overkill for many buyers, if your main requirements is a full complement of the fastest connectors, very solid construction quality and simple to use overclocking that runs stably, this is a fine choice if you already have a Skylake CPU. However, if you’re buying a new board with new components, the new Z270 models, with their potential for future performance upgrades to things like M.2 drives plus Intel “Optane” support carry with them a bit more future proofing. But if you just want the core component of a new PC that works fast and stably right now and will last for years, it’s well worth keeping the Designare in mind.